From a friendly and relaxed atmosphere to having a few drinks with fellow travellers, we guarantee you will not be disappointed. Oh, did we forget to mention we are the only hostel in Split with a bar? Newly renovated, this must-visit tourist haven is centrally located in the heart of the city's historic Diocletian Palace. Surrounded by all the must see attractions and entertainment, Fiesta Siesta is only a short walk away from Splits greatest museums, shops, restaurants, nightlife and beaches. We are located in two buildings directly across from each other. Both buildings have also been completely refurbished to give you a good mix of traditional Dalmatia and home comforts. On arrival you will be greeted by our friendly English speaking staff who will be sure to answer any questions you may have. Whether you want to know the best place to experience Dalmatian cuisine or where you can go and top up that golden beach tan, your can be sure our guys know Split inside out! Located conveniently below us is the famous Charlie’s Backpacker Bar. Over the years Charlie’s bar has risen up the ranks as a must do to experience on travellers time in Split. Whether you want to meet other travellers, or mingle with locals, Charlie’s is the place! With themed nights, social nights (such as happy hour, dinner dates, live sporting events and more) it is pretty hard to leave Charlie’s without making friends for life. Run by Aussies and inspired by our own travelling experiences around the world as backpackers, Fiesta Siesta, Booze and Snooze and Charlie's have teamed up together to make sure you experience the best possible. We were the first to pioneer hostels in Split so come and visit us and we are sure you will have an unforgettable time! 10/10 would stay here again. Go to Charlie’s, do the challenge and have a good time. S/o to Glen and Kim cause they’re the best. 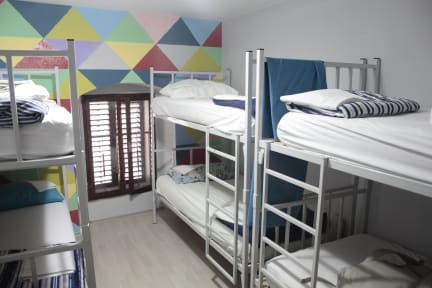 Clean and comfortable room in a great location but not really a hostel as there is no common area or any other facilities. , not even a reception area. The nightly dinner is recommended...provided you are not on a tight budget. Overall I’m sure it’s a great party hostel during peak season. Basically just a set of rooms on top of a bar. I really wouldn’t recommend going there during offseason. No kitchen, no common room just dorms and a bar downstairs. Staff were pretty poor and basically non existent during my stay. There main focus is peak season obviously. Anyways if you’re looking for some social interactions around this time of the year I wouldn’t really recommend it seeing as there was nobody in the hostel but me. We were in the hostel across from Charlie's Bar. Not the cleanest re: showers & microwave but it was manageable. Because of it being off season there weren't many other travels to chill with in the hostel but having Charlie's Bar was great. It's a loud area throughout the week & weekend so I'd advise to find somewhere quieter if you want some sleep before 1/2am. Group dinners every night are good to meet people but the restaurant is fancy so not really for a traveler's budget. Adios MotherF! I have traveled around the world for over 35 years and have stayed in many hostels, backpackers, pensions, etc. I have to say that I was thoroughly disappointed with this choice. Charlie’s bar (also the check in) was like walking into an ashtray. My room had sheets with holes that did not look particularly clean and the walls were a dirty white. The shower floor wasn’t clean so I decided to skip the shower for one night there. Fun for a late night party, but stay somewhere else!